at ease with the moment…. breathe, but echo this silence? 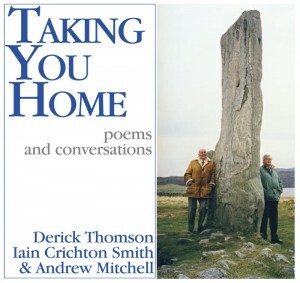 Two distinguished Scottish twentieth century poets, Iain Crichton Smith and Derick Thomson, grew up in the village of Bayble on the island of Lewis. This intrigued Andrew Mitchell and with London-based BBC Radio Producer Julian May, he set off with both poets for Lewis and an exploration of their cultural roots. The poets’ response to their island childhood home was complex. Issues of language, culture and religion, revealed unresolved tensions, which had clearly influenced the work of both writers. Only after the visit was over, and following the death of Iain Crichton Smith was Andrew Mitchell able to place this experience in perspective, writing his own poem sequence, Taking You Home, which draws upon the visit, island culture and the work of both Bayble poets.